Little pictograms can express cravings for hamburgers, pizza, even fried shrimp. Superdawg Drive-In asks, why not hot dogs? “Emojis are a universal language,” says Laura Ustick of Superdawg Drive-In (multiple locations). “People like to use them to tell people what they’re craving, what they’re having for dinner.” When it came to Superdawg’s attention that there was a startling absence of the hot dog in available emojis, they led the charge to persuade emoji creator Shigetaka Kurita (and President Obama) to give us one. Read about our writer’s nostalgic visit to Superdawg, Chicago’s legendary drive-in. Here’s what you need to know about this underground movement: 1. It began with this Twitter conversation on January 3 between Superdawg Drive-In and two of its followers and sparked the hashtag #hotdogemoji. 2. Though no emojis exist for the hot dog, other foods have their tiny pictograms: hamburger, pizza, chicken leg, donut, even a rainbow lollipop can all be expressed via emoji. 3. The hot dog emoji was created by Certified Cicerone Jenny Pfäfflin in about five minutes. She’d just posted a photo to Instagram of an elote dog she’d had at Hoppin Hots, and when she sought to caption it with an emoji, she was shocked to find she couldn’t. “Through serendipity,” she says, she discovered Superdawg Drive-In’s campaign. 4. “A cause like this needs an awareness ribbon,” Jenny says. 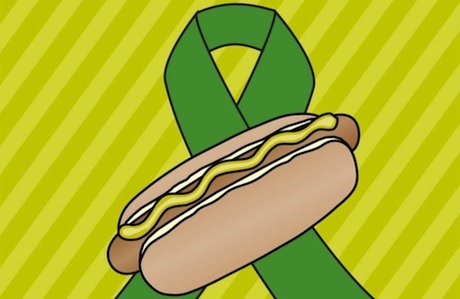 The green ribbon matches Chicago’s famous neon-green relish. 5. The emoji campaign has spurred the creation of a Facebook page and a Change.org petition. 6. Since the Change.org petition was created, it gets about 10 signatures per day. 7. Nationwide supporters include California’s Pink’s Hot Dogs and Hank’s Haute Dogs in Hawaii. 8. Local supporters include Hot Doug’s, Wiener and Still Champion, newscaster Bob Sirott, and competitive eater Patrick “Deep Dish” Bertoletti. 9. The campaign has shed light on the need for other food emojis: tacos and cupcakes are at the top of the list. 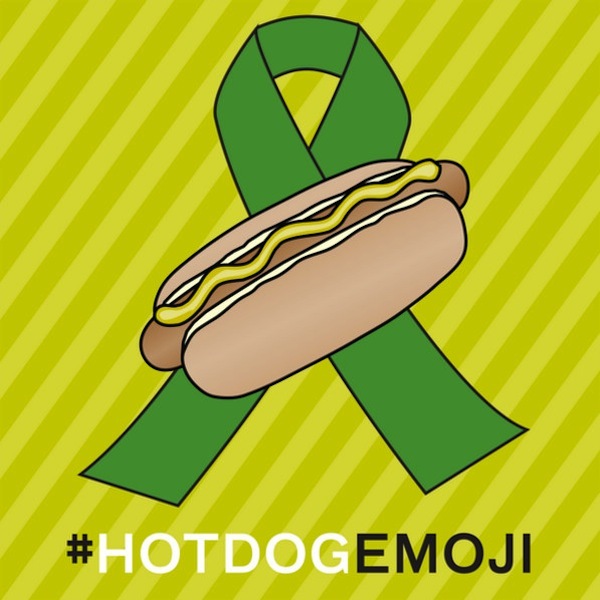 To support the hot dog emoji movement, sign the Change.org petition, Tweet with the hashtag #hotdogemoji, and click “like” on the Facebook page.